Fillable Da Form 3595 R is not the form you're looking for?Search for another form here. Who needs a DA form 3595-R? What is a DA form 3595-R for? When is DA form 3595-R due? How do I fill out a DA form 3595-R? 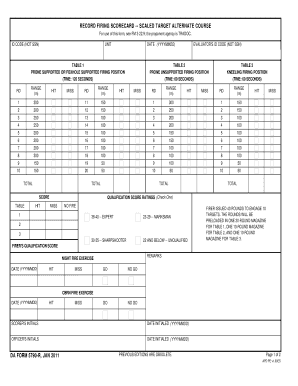 This is a form for military firearms experts who conduct trainings and need to keep scores of the soldiers’ results. Firers should not fill out this form. 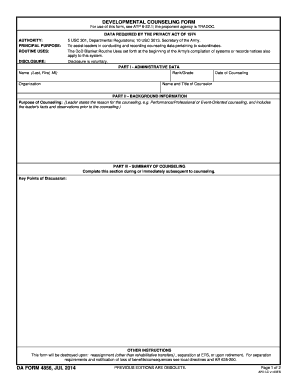 Whenever the agency requests an examination, this form will be needed for official records. It is called “Record Fire Scorecard”. It is required at every training, examination, and qualification for a vacancy involving shooting skill of the person who passes the exam. Form 3595 was designed by the Army. It doesn’t require any addenda. You can find other DA forms in our library, however. It must be filled out during every examination. The due date will be decided by the requesting authority. First put down an ID code, unit, date and evaluator’s ID. Then there are three tables. Table 1 - Prone supported or foxhole supported firing position, Table 2 - Prone unsupported firing position, Table 3 - Kneeling unsupported firing position. Other tables are dedicated to qualification score ratings, aiming device used, firer’s qualification score, and remarks. You will find more specific instructions on the second page of this form. Send it to the requesting authority and keep a copy for your records. 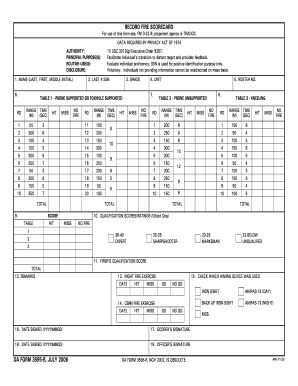 Full text of "Rifle Marksmanship M16-/M4-Series Weapons - Change 1"
DA FORM 3595-R, SEP 2008. APD PE v1.00. Page 1 of 2. RECORD FIRE SCORECARD. For use of this form see FM 3-22.9; the proponent agency is TRADOC.